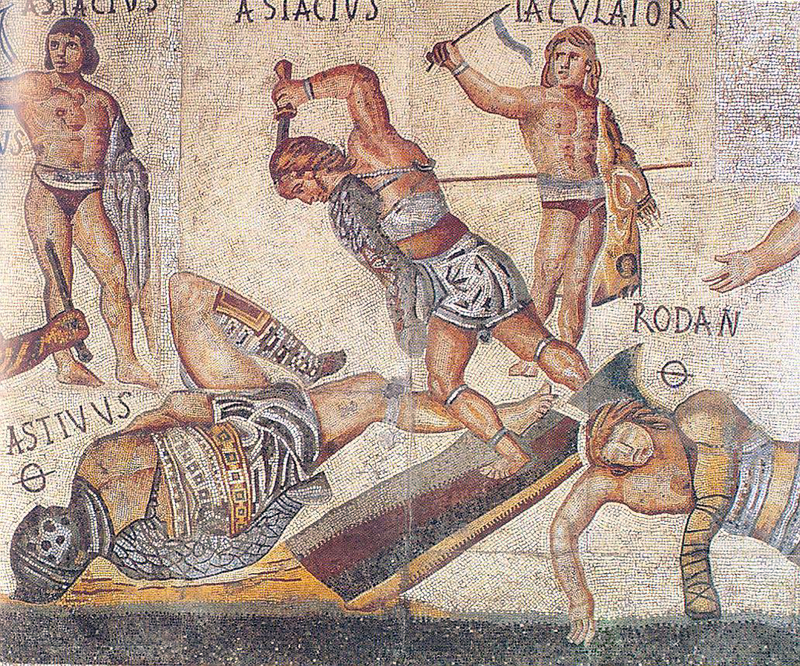 Detail of the Gladiator Mosaic, 4th century CE. Augustine’s friend Alypius became obsessed with gladiatorial shows. Starting from Book VI and onward through Book VIII, Augustine describes his conversion to the Christian faith. It is good to bear in mind that he depicts conversion (or at least his own personal conversion) as a long process and not as a single event. He devotes a large amount of Book VI to the people in his life in Milan: his mother Monica; Ambrose; and two friends from Africa, Alypius and Nebridius. In Chapter 2, Augustine writes that Monica would often “take meal-cakes and bread and wine to the shrines of the saints on their memorial days” which was customary to do so in Africa; however, when she arrived to Milan to join her son, Ambrose forbid her from practicing that custom. Even today, there are many sects within Christianity that include icons, statues, and iconography in their worship. What are your thoughts on this? Is it breaking the commandment forbidding God to be depicted in a graven image? Or is it permissible because it aids in the focus of worshiping God? What about carrying a rosary or even a simple necklace with a cross on it? Is that in a way idolatry? Why or why not? On a different but related note, have you had a teacher, pastor, or another person convince you to stop a religious practice because he or she showed you how mislead you were? In Chapter 3, though his personal one-on-one contact with Bishop Ambrose was limited, Augustine held him in very high regard. What do you make of religious leaders or pastors who are elevated or esteemed so highly by people that they seem to be given a “holy” or even “divine” status? Do certain pastors or religious leaders play the role of holiness or are they truly trying to live a life of genuine integrity and Christ-likeness? Or is that just an illusion? How do they deal with temptation? Why do people give them such high status? What’s the draw for them? To Augustine, becoming a Christian or answering the call to become a Christian was the call to a “philosophical” life. This meant a life designed to be as simple as possible and free from external demands, as this would let them devote his or her life to the pursuit of wisdom. Augustine describes how Ambrose was often too busy to meet with him because he had devoted so much personal time to reading and studying. To Augustine, Ambrose seemed to epitomize a mind for God. How does one glorify God with the mind? Do you think this aspect is often neglected in the church and or believers today? Why or why not? Towards the end of Chapter 3, he writes: “I learned that your spiritual children, whom by your grace you have made to be born again of our Catholic mother the Church.” Do you agree with Augustine here that you are baptized to the Church? Aren’t you baptized to God? Is there a difference? Do you need the Church in order to be truly baptized? Why or why not? In Chapter 4 he writes about his conversion process. Do you believe that conversion (or even a “born again” experience) is a process or an instantaneous, once-in-a-lifetime experience? Is there a difference between the two? Does conversion or born again experience occur in one’s mind or is it something supernatural that happens to you that is beyond one’s understanding at a certain level? Augustine had many struggles, doubts, and questions about Christianity as he describes in this chapter. Do you relate with him here? Did it take time for you to accept the faith or are you still in the process of exploring and seeking? Did you see Christianity as not being a childish belief system, as Augustine discovered for himself later on? Looking back, do you see God’s guidance and leading you to become Christian or was it more of your decision to come to the faith? Or was it a cooperation between you and God? What are some lingering doubts and questions you still have about the faith? In Chapter 4, Augustine writes about his obsession with certainty: “I wanted to be just as certain of these things which were hidden from my sight as that seven and three make ten, for I was not so far out of my wits as to suppose that not even this could be known.” In faith, can a believer ever come to a place or position of absolute certainty (where you have no doubts whatsoever) as Augustine had wanted? Can you ever be 100% certain of things such as Jesus’ divinity, the Resurrection, his miracles, etc.? Is there an epistemological difference between faith (or knowledge of God) and science? In other words, do you believe science to be closer to truth than theology ever can? In Chapter 5, he writes: “[S]ince we are too weak to discover the truth by reason alone and for this reason need the authority of sacred books, I began to believe that you would never have invested the Bible with such conspicuous authority in every land unless you had intended it to be the means by which we should look for you and believe in you.” Furthermore, he writes, “the authority of Scripture should be respected and accepted with the purest faith.” Do you agree with Augustine here in his view about the Bible and biblical authority in general? Do you agree with him that human reason is too weak without the Bible? Why or why not? Explain. What is the proper role of the Bible in Church and the believer’s life? In Chapter 6, he writes about an epiphany he had when he encountered a drunk beggar who was laughing and singing. He realizes that his ambition to succeed made him more miserable and finds that money and status doesn’t necessarily lead to happiness. He writes, “I was hoping to win the joy of worldly happiness, the very thing which this man had already secured at the cost of the few pence which he had begged.” What is happiness? Is it relative or is there an absolute, universal standard everyone strives for? Even though the world tells us that we should strive to work harder, get a better job, and make more money, and therefore live a happier life, why is it that that’s not the case all the time? (In your response, please refrain from using too much hokey spiritual/religious claims like, “This is why you need Jesus/God in your life so that he will become your true happiness, etc.” unless you can philosophically and or theologically justify it and add some depth to your response please.) Can a Christian have both worldly success and live an authentic Christian life? In other words, can he or she drive a Bentley, own a private yacht, a private jet, and live in a mansion in Beverly Hills and still be a God-fearing Christian? Or are there too many temptations that come along with massive wealth? Is this what Jesus meant when he said, “It is easier for a camel to go through the eye of a needle than a rich man to enter into heaven” (Matt. 19:24)? Do you feel that Augustine is presenting us with an “either/or” situation – i.e. you can have worldly success but not be an authentic Christian or vice versa? In Chapter 7, he writes about his friend Alypius. He writes that he came from a well-respected family and had a “natural disposition to goodness.” Though for a while he succumbed to worldly temptations in his youth, God had a plan for his life to eventually become a bishop. Augustine sees this as all coming from God’s providence upon his friend’s life. He even sees himself as an instrument of God upon his friend’s life, to lead him to God instead of squandering his life on worldly things. Do you believe that God has a plan for everyone’s life? Is it all good for each individual or is it arbitrary on God’s part to decide who gets a good life and who doesn’t? Are these plans set in stone and unchangeable? Could it be possible that God’s plan for one person was to live a poor life under bad circumstances, but this person persevered and out of his own will overcame many obstacles and live a successful life, and thereby thwarting God’s will for his/her life? If a person gets cancer, is murdered, gets kidnapped, etc. is that all part of God’s sovereign plan for his or her life, or is it the “fault” of that person or just a random unfortunate event that even God was not aware of? By Project Augustine in Augustine's "Confessions", Theology, Uncategorized on February 26, 2016 .